Napoleon once said that in victory you deserve champagne, but that in defeat you need it, a sentiment with which I could not possibly agree more. Enjoyment, or as Nero called it ‘feeling human,’ is all too often reserved for special moments, or we allot ourselves specific time inside of our busy schedules for brief interludes of pleasantries. By doing so, one has essentially accepted that pain and drudgery are the norm, with enjoyment relegated to being that proverbial diamond stuck in the metaphoric ruff. After all, who among us isn’t more familiar with the coil lights of our offices than we are with watching the sunset? Or, perhaps more apropos to our subject, how many of us are still waiting for that ‘Special Moment’ to un-cellar that overpriced vintage that’s been on hand for too many years now? Or we’ll try that new posh restaurant ‘someday,’ a strangely elusive designation of time. Yet, and perhaps far worse, at the end of a long day, it can be all too easy to give into the temptation of simply eating to survive, forgoing a proper meal either for lack of time or a lack of will to endure the effort, and so we submit to yet more drudgery – this time of the culinary variety. While it’s certainly an understandable temptation, it’s one that need not be abided. Allow me to explain. Working at home means I’m always in the office, and so I’m all too familiar with the constant temptation of doing “Just one more thing” before finally calling it quits, and when I finally do I hardly feel like starting in the kitchen. It is for precisely such moments that I love having gourmet alternatives on hand that can ease the preparation with a delicious, healthy meal. That’s precisely where today’s recipes come in, either of which can be prepared in under twenty-five minutes – Tilapia with Wild Rice, and Salmon with Linguine and Fresh Spinach, using Bumble Bee SuperFresh®. Now, I’m not typically one for frozen foods, so you can trust me when I say that both the Bumble Bee SuperFresh® salmon and tilapia are easily restaurant quality (yes, from a good restaurant), and are both naturally seasoned, without any ‘cheap’ breading or sauces. 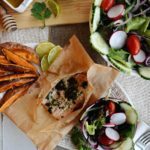 Since both the salmon and tilapia come wrapped in parchment paper, the typical mess and ‘fishy’ smell is entirely avoided, meaning it’s enough to prepare them directed. 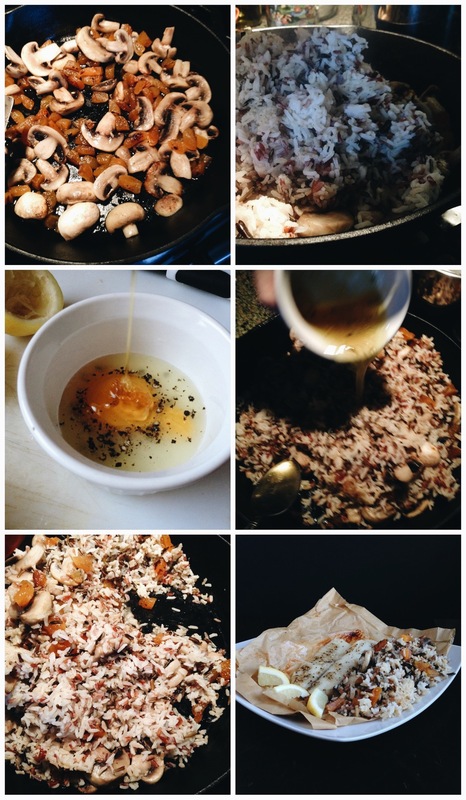 For the wild rice, simply prepare a frying pan with butter and olive oil – preferably cast iron – and then add in the mushrooms, chopped apricots, and seasonings. You’ll want to sauté them just until a slight char appears, by which point your rice should be finished cooking, and you can combine them. Then, just prepare the dressing for the rice as directed below, and you’re finished. While I prefer to pair the linguine with the salmon, and the tilapia with the wild rice, either would pair excellently, as it’s really just a matter of taste. In either case, however, both meals can easily be prepared in under a half hour, meaning there’s never a reason not to enjoy a gourmet meal no matter how tight the schedule. What are some of your tips for eating well despite a packed schedule? We would love to hear from you. Don’t for get to try out Bumble Bee SuperFresh meals for a quick and delicious dinner no matter what life throws your way. Prepare the Tilapia as directed. 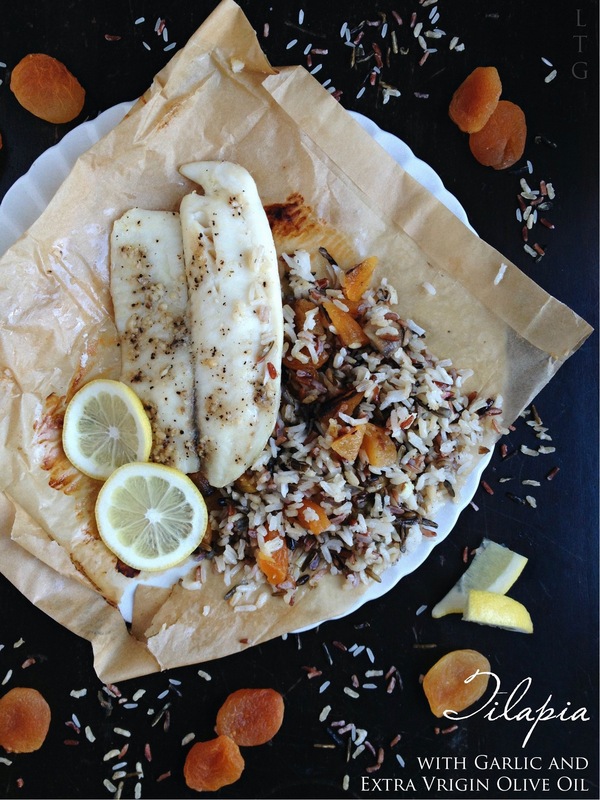 Cook the wild rice as directed and set aside. Heat a large cast iron frying pan with the butter and olive oil. Add the sliced mushrooms and chopped apricots. Let the mushrooms and apricots sauté until a slight char appears. Add the rice and toss. Pour the dressing over the rice and toss. Prepare the linguine as directed. Drain and set aside. Heat a large cast iron frying pan with the butter and olive oil. Add the garlic and sauté until the garlic is fragrant and slightly golden. 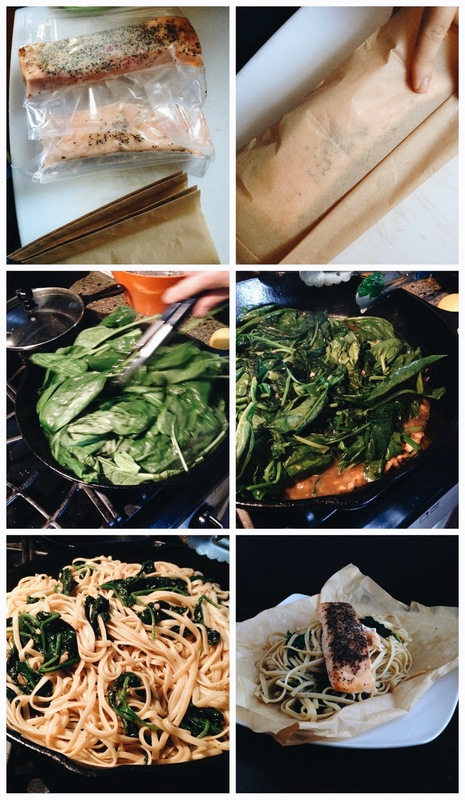 Add the fresh spinach and toss until slightly wilted. Add the linguine and toss. Drizzle with a little olive oil and more freshly ground black pepper. 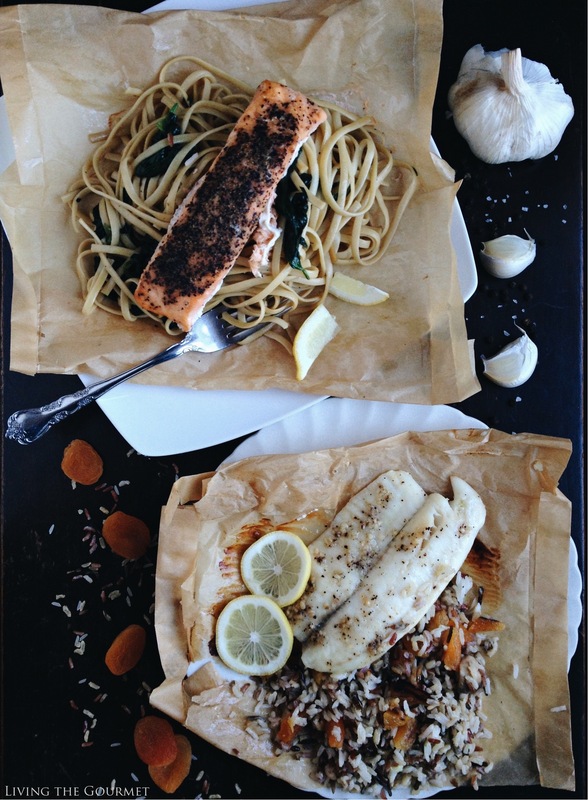 I love cooking fish in parchment. Such a great way to add flavor and keep everything moist. Plus it makes clean up a whole lot easier. Whoa- I never knew bumblebee came out with a range you could prepare this way- I'm so intrigued! The flavors of this dish sound delicious! These meals look delicious and the fish looks really nice! We love fish and these are great ideas that would totally enjoy! Thanks! Catherine, Thanks for the heads up on quality frozen seafood. My choice would be the salmon with spinach and linguine. Take Care, Big Daddy Dave. 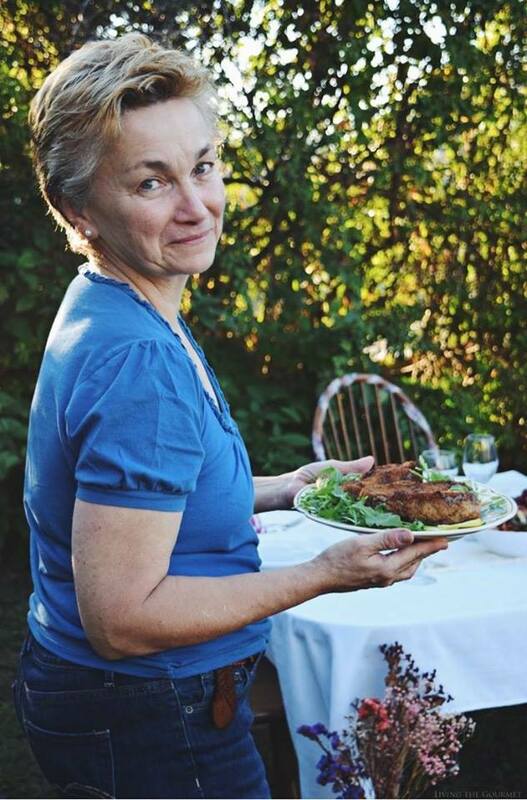 Hi Catherine - dining on either of these meals would be my interlude of pleasantness! 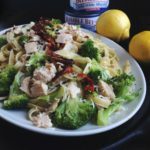 My daughter would LOVE the linguine and salmon and I have my heart set on the apricot wild rice and tilapia - now to find me some BB superfresh meals! It all sounds great, Catherine! It looks like parchment is the way to go, after reading this. Both meals look divine! Seriously tempting!!! 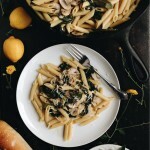 I need to make weeknight meals more like yours!!! So fresh and delicious! I am going to make some fish with rice for the dinner too. I love fish! What a beautiful meal you created! I think I just drooled! YUM! Thanks for joining Cooking and Crafting with J & J! 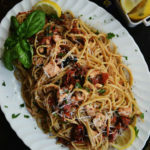 Looks delicious love those perfect slicer of salmon with linguine. Thanks for sharing with Hearth and Soul Blog hop. pinning.